Highlights, coverage, and results from the top meets across the country on the weekend of November 1st. Check back all weekend long with updates on the top national performances in high school cross country. Idaho State Championships (ID) - US #9 Elijah Armstrong wins in his first state XC meet with a 15:25 performance in the 4A race, which bests his previous all-time best on course by 9 seconds. Mountain View boys and Couer d'Alene girls are ready for make a NXN nationals push after their Idaho 5A state title victories. Fastest girls time of the day belongs to Emily Hamlin of Boise Senior, who rolled a 18:14 win in 5A. Iowa State Championships (IA) - Thomas Pollard finally got that elusive state cross country state title. After two runner-up finishes last two falls in Iowa, the US #19 ranked Pollard picked up his first title decisively with his season best 5K time of 15:04 putting him 20 seconds ahead of the next fastest time of the day in 4A champ Daniel Soto and over a minute ahead of closest competitor in 3A race. The Linn-Mar boys and Johnston girls had the best team performances of the meet. Minnesota State Championships (MN) - Wayzata boys and girls sweep team titles for second straight year at Minnesota State meet. The Wayzata boys put 3 in the top 10 including race champ Connor Olson (15:17), while the Wayzata girls packed it up with a 14:37 team average (4K) and 49 second spread for their top 5. The Hasz twins of Alexandria Jefferson go 1-2 in 13:40 for champion Megan and 13:44 for runner-up Bethany. Pennsylvania State Championships (PA) - US #17 Brianna Schwartz won the AAA girls race with the 2nd fastest time ever at Hershey Park behind only last year's Foot Locker Nationals champ Tessa Barrett with her 17:39 performance. The US #10 ranked Pennsbury girls regained their state title lost a year ago to US #21 Unionville by narrow 5 point margin. Jake Brophy of Central Bucks East runs out of his mind and breaks the Poop-out Hill course record in Hershey, PA. (On-Site Coverage). Tennessee State Championships (RI) - The Daniel Boone boys, led by two of the top three individuals of the meet in Adam Barnard (15:43) and James Garst (15:51), were able to withstand the challenge from last year's NXN top 3 team Brentwood and win the Tennessee state team title 47-50. The Morristown-West girls continue to race like a team that should be nationally ranked and challenge for national berth as they were well over 100 points better than the next best team in their state led by Cherie Wilson, who was the fastest individual champ of the meet at 18:30. Wisconsin State Championships (WI) - Off of Olin Hacker's demanding 36 second victory and repeat individual state title, the boys of Madison West take the Division 1 team crown. Got race pics & vids, meet info & news, or results? Email us. Or tweet at us (@milesplit). 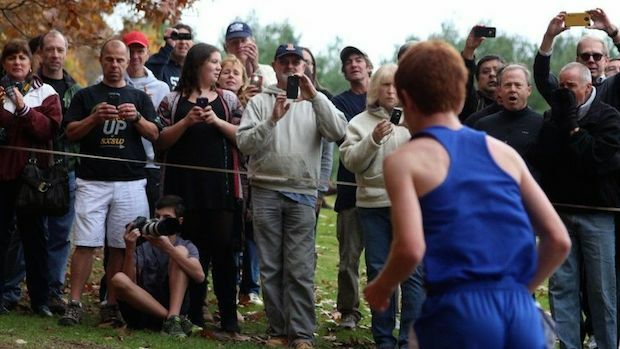 Check out our national database of XC stats as the results pour in!